Back in mid-May, I released my latest pattern in a markedly different way than usual. The Bundled Up Bindle Bag did not have a conventional price, nor was it meant to be given away as a freebie. 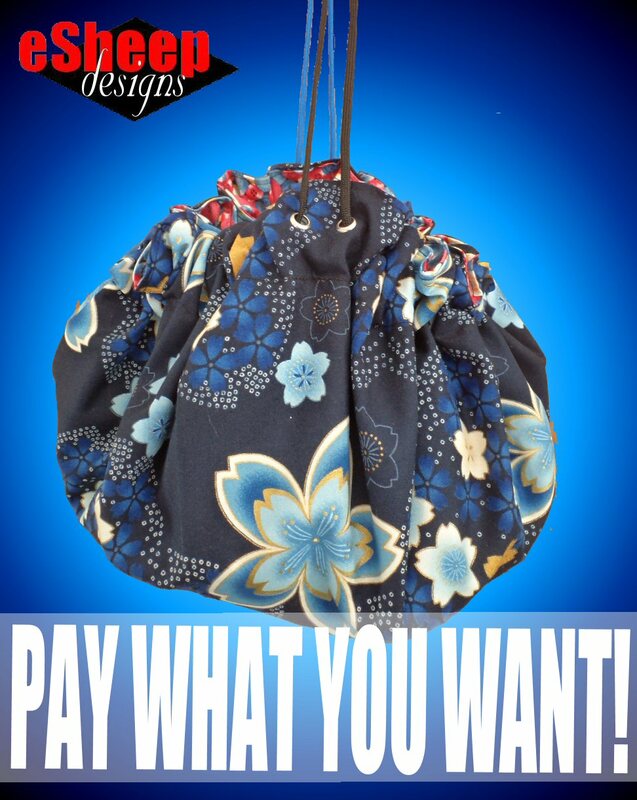 The pattern listing on Craftsy clearly indicated that it was being offered on a "pay what you want" arrangement. If you were aware of this offering, you may be curious as to how it played out. Well, on July 31 — tired of the lack of any variable data — I deleted the PWYW option and put up a conventional version of the pattern for two bucks. After the first fifty or so purchases, I had it in mind to pull the plug on the experiment if it did not pay anything after ten weeks; it was ultimately eleven weeks and a few days. So there you go. But before anyone jumps to the conclusion that the experiment was a failure, I can say that the numerical data (such as it is) is still informative in and of itself. With just under 300 "sales", the numbers reveal that a whopping 71% did not even download the pattern at all. This leaves only 29% who may actually have opened up the PDF at any point in time. Intriguing, isn't it? Unexpected? Not so much. Case in point, before I pulled the PWYW version, I uploaded a stripped down version of the PDF stating that the pattern was no longer available as a free item and that the purchaser will have to go to my payment page to make a "donation" of some sort (after which, I would send them the full PDF), or they could purchase the newly available pattern for $2. I believe the way it works is that — even though I deleted the PWYW pattern — previous purchasers will still have the option to download it from their individual accounts, only now they will be downloading the most recent version, which doesn't include instructions. To hazard a guess, I'd say that most people won't even be affected by this change; as in, if they've never downloaded it, they likely never will. You and I both know that there are so many free patterns out there, it's easy for them to get lost in the pile. The first bullet point is a given: the PDF is a product with a low marginal cost. "Of course, the anonymity of the Internet removes the social pressure one feels after being served personally by a human being. It’s one thing to have the amount you choose observed and another thing to download stuff without being seen." Simply put, customers do not see me standing at the checkout counter watching them leave without paying anything. (I knew that from the get-go.) But I had hopes that perhaps a few people — or maybe just one?? — might see the opportunity to drop a token "thank you" for the perceived freebie. I'm not positive about the third bullet point, but in the world of PDF patterns, I think it's safe to say that this pattern could have been sold at a range of prices (if not a particularly wide range), given what I've said in the past about the varying prices for zippered pouch patterns. The fourth bullet speaks to a condition that is hard to find in this arena. For buyers and sellers to have a strong relationship, designers would have to have sold many, many patterns to many of the same people over a period of time. That's certainly not where I sit. Finally, I believe the fifth bullet is true, but in this marketplace, it works in reverse. 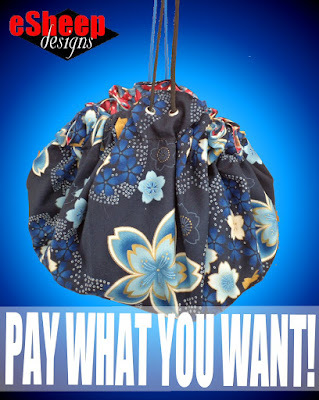 What I mean is that unlike how restaurants have paid competition, my competition is in the abundance of free patterns. Anyway, to bring this update to a close, by the end of the week in which I put an actual price on the Bundled Up Bindle Bag, I had sold two of them. So goes my pricing experiment. Was the result more or less what you had expected? Interesting to hear how your experiment went, Rochelle. I really didn't know how you would go, but I did expect some of your sales would be actual sales. Too many people now expect something for nothing. I'm sure, as you say, it's due to the anonymity.